On this trip, I travelled with one of my best friends of mg, Stace :-) We were accompanied by Ryan and Leonard (Ryan's friend who stays and studies in Sydney). It was a wonderful break from the heat and humidity of Singapore - the weather in Sydney hovered around 11-19 degrees, save for the first day when we were greeted with "the coldest morning in four years". What a welcome. We flew over via British Airways, and we had a very pleasant flight there (at least I did). It was a night flight, so I slept for the bulk of it and watched two and a quarter episodes of the Great British Bake-Off. We were lucky enough to get front row seats, although getting the entertainment screen up was a bit hard as the button was so stiff! Stace and I tried so hard before giving up and asking one of the stewards to help us, upon which he effortlessly pulled the screen up. Magic, he called it. We headed to the fish market for breakfast after dropping our bags off at Leonard's. It was a lovely walk from his place (albeit a very cold one). We made a pit stop at a cafe called the Pigeonhole along the way, where Stace and I got coffee and Ryan had tea and an almond croissant which was the best almond croissant that I have ever tasted. Onward to the fish market! It was just as I remembered it from my last visit. Ryan and Leonard got most of the food. I only had one slice of sashimi (which was fresh and lovely) but I have come to the conclusion that sashimi is best not eaten in the morning... My tummy felt a little funny after. After the fish market, we went to the Sea Life Aquarium to see the friends of the fish we just ate. The aquarium was painfully underwhelming... It might have been the effect of the complete lack of sleep (for Stace and Ryan) and an insufficient amount of sleep (for me) as well as the fact that pretty much half of our time spent in the aquarium involved walking up and down numerous ramps to get from one exhibit to another, surrounded by oldish, industrial-looking walls, painted a grisly, dismal blue. Dinner for the day was at Rockpool Bar and Grill, our most expensive meal of the trip. The wagyu bolognese that Stace and I had was pretty good though (and the cheapest thing on the menu) heh. OH, and this was the restaurant at which I got carded. We ordered wine and I was asked to show my ID as I guess I don't look 18... At least it means that I look young? Walked back, and that was the end of our first day! The effects of the night flight stayed with us (or me, at least) and resulted in me getting up at a horrifying 10:45am that morning. At 8:45am in Singapore it would have been okay, but as Sydney is two hours ahead of Singapore, 10:45am is horrifying, especially while on holiday. What a waste of the morning! The guys got up early to cook breakfast for us, which we ate before renting a car to go to the Adriano Zumbo Patisserie! 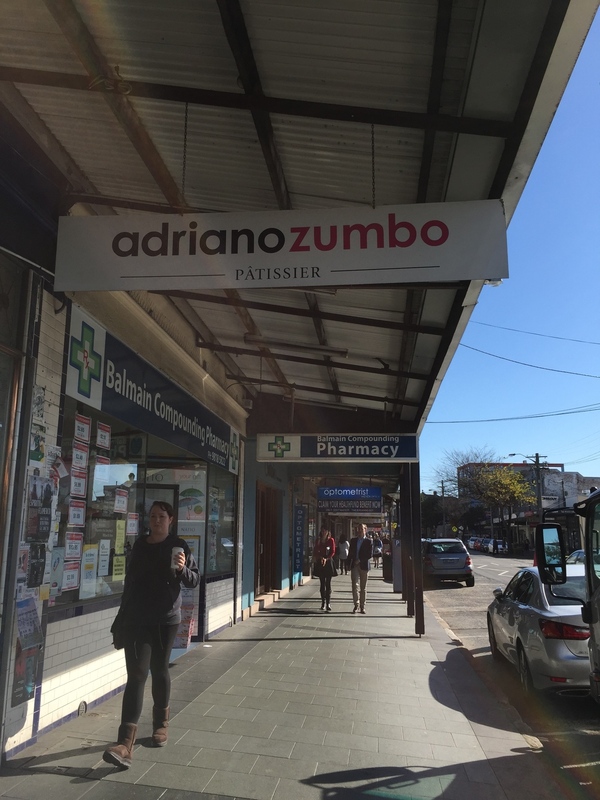 This was one of the places that ranked pretty highly on our to-go list, as Adriano Zumbo is a famous patisseir from Masterchef Australia. We didn't realise that the patisserie had no seats, it was a takeaway concept so we decided to just buy a number of different things back to the apartment to eat. We ordered a lot of things to try, pictured above and arranged by Stace, Leonard and I! Of everything we ordered, I liked the cakes the best. We had the V8 passionfruit (the orange-yellow square at the bottom of the picture) and the 'Ed, it's been a long time' cake which was like an opera cake (to the right of the passionfruit cake). I loved them both, they had a lot of different textures going on and tasted fantastic on the whole. You have to eat the different layers at the same time to get the full experience!! The zonut and the palmier were from the bread and pastry display. I felt that the zonut had too much sugar on the top, and I felt like I was just eating plain sugar at certain points. The custard inside was good though, creamy and it contrasted with the crisp texture of the zonut beautifully. I liked the palmier; it reminded me of TBB's Kouign Amann. I think some would find it too sweet though. The rest of the desserts weren't that amazing (to me, at least) - I didn't eat much of the quiche but the guys seemed to like it a lot, I think I would have enjoyed the one bite I had a lot more if it was hot. The lemon meringue tart was weak, both in terms of the filling (a tarter, more lemon-y one would have been nice) and the pastry - the meringue felt too light; the crust too soft. Stace and I had the zumbarons at night, and they were ok to me - I heard that they were disappointing for some but I guess having little-to-no expectations of something helps. I had the salted-butter-toast one or something like that and I quite liked how it tasted faintly of butter toast. Ryan had the salted caramel popcorn one the next day and he discovered that taking a bite of the macaron/zumbaron along with a sip of champagne is a delightful way of eating it. I can attest to that. After our pretty-much-a-pastry-and-dessert-lunch, we took the train down to Circular Quay, with the intention of visiting the Taronga Zoo. Unfortunately, by the time we got there it was 2 something and we were told by the ticket man that there wasn't much of a point in going, as the zoo would close at 4:30 that day. So we hopped on a bus to Bondi Beach! It was a 45-minute journey (I think, I can't quite remember) from the city, but it was a lovely journey. My favourite part about road trips, bus rides or train rides above ground is looking out of the window, admiring the sights and just letting my mind wander. It's one of life's simple pleasures. Bondi beach is beautiful. (Loving the alliteration going on in that sentence). I've come to realise that I do love the beach, and I love the sea - I just don't want to swim in it. I think the idea of swimming in the sea with fishes and all is a lot nicer than the actual act of swimming, maybe until you see these animals up close but I'd rather stay dry. This might change in the future, but right now, this is how I feel about it. This is the part where I'm going to spam photos because you can never have enough pretty photos of the sea. We decided to stop by at a cafe for some fish and chips while walking along the beach! Bondi has a lot of street art (or beach art?) lining the walls just on the outside of the beach, and some of them really are pretty cool. We had initially planned to go on the Bondi to Coogee coastal walk which was about 6km long and would have taken us about an hour or so, but by the time we were done with our late lunch/tea we were advised by the kind service staff at the cafe that it would be better to walk another day as the sky would turn dark before we could finish the walk. And that's how we ended up on the rocks, watching the sunset. It was quite a lovely sight. When the sun set, we made our way back to the city to try Pancakes on the Rocks (for dinner, because breakfast for dinner is the best thing ever), where we were greeted with a line that snaked out of the door. Well, expectations were certainly raised then. Did you know that Pancakes on the Rocks was a 24/7 joint? We only found out when we reached the front of the queue. If only we had known just a bit earlier... To be fair, however, the queue did move rather quickly! I had the Pancakes with sausages, grilled tomatoes and scrambled eggs. I really wanted to try the banana pancakes, but I needed something savoury after all those sweet treats in the day. I quite liked what I had, my scrambled eggs were sufficiently runny, and the grilled tomatoes were delicious. I don't think they're very consistent, though - Ryan's side order of scrambled eggs arrived dry and looked overcooked. Also, beware of the bacon - I didn't try any myself, but the others agreed that it was very salty and it was alluded to as the trigger for Stace's cough. The pancake itself was very much like a McDonald's hotcake, but fluffier, larger and with a little more flavour. Good thing I like hotcakes. The serving is huge, by the way - I could only manage one pancake!